The Caribbean Sea is bounded by South America, and so becomes a destination of choice for cruisers who want to stay warm while avoiding the hurricane season. 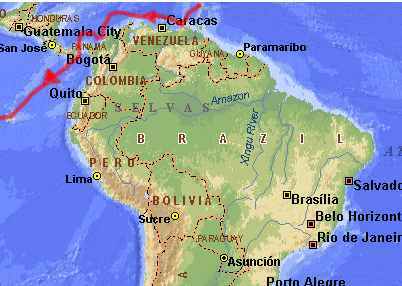 We skimmed the north coast, spending the hurricane season in Venezuela, Christmas and New Year's in Bonaire and Aruba, visited Colombia, the San Blas Islands and then transited the legendary Panama Canal before heading into the Pacific Ocean. Our first stop was the Galapago Islands - where Darwin firmed his theory of evolution or natural selection.